Doctors Heed Prescription For Computerized Records : Shots - Health News Doctors are rushing to take advantage of federal incentives to computerize their offices. Even now, many physicians still rely on paper records for patients. While the digital approach offers some advantages, the cost and complexity of switching can be daunting. Uncle Sam wants your doctor to go digital. And the federal government is backing that up with money for practices that start using computerized systems for record keeping. 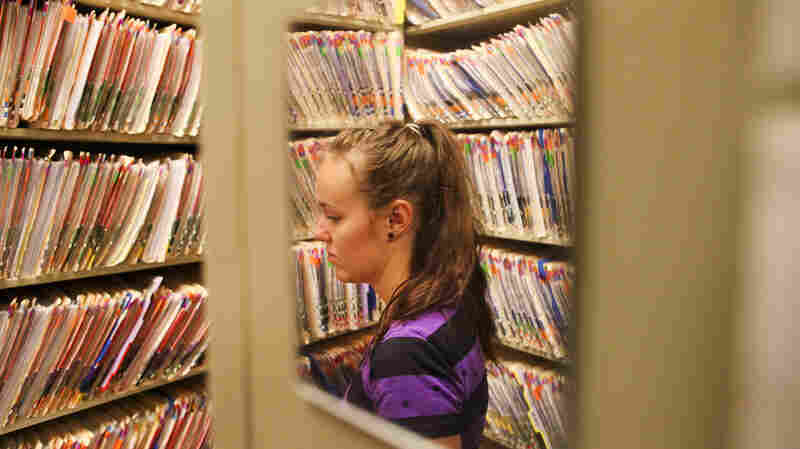 Nearly half of all physicians in America still rely on paper records for most patient care. Time is running out for those who do to take advantage of federal funds to make the switch. So practices like Colorado Springs Internal Medicine are scrambling to get with the program. Nearly 200 patients come through the office on a typical day. Doctors and staff pop in and out of exam rooms and offices constantly, carrying big stacks of manila folders holding patient charts. Behind the front desk, Dr. Jay Kinsman stands at the practice's information nerve center. 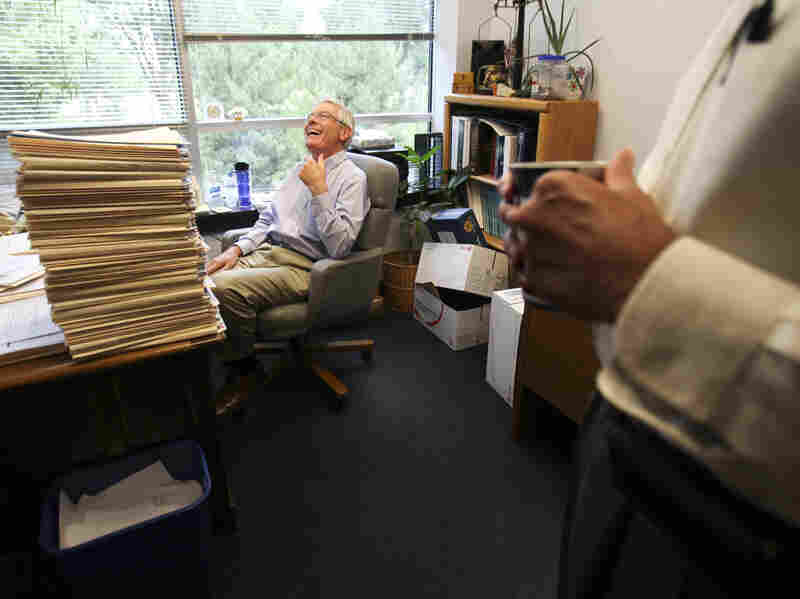 "There'll be probably 500 pieces of paper come in on the fax, two times, three times a day," he saysi with a chuckle. "If that goes down we might as well close." He is only half-joking. The office has a backup fax machine just in case. About a year ago the practice decided it was time to go to an electronic health record system, or EHR. Kinsman took charge of shopping for the right one. He quickly felt overwhelmed. "Do we really need 250 different EHRs, and 30 fairly widely used ones and 15 really big ones?" he asks. "Could we get by with one? Would we do better with just one product?" Actually, there's closer to 1,000 products out there. The market exploded when the federal government started offering doctors financial incentives to buy them. The government also said that those who don't go digital will face penalties in the future. So, all across the country, doctors like Kinsman are taking sales calls. His decision will affect not only his and his partners' days but also their incomes. "When we were starting to think about this, we were hearing dollar figures on the order of $40,000 per physician to purchase an EHR and install it, and then lost revenue in the first two or three or four months," he says. "Basically we're planning on seeing only half as many patients a day for the first two to four weeks." There are also decisions about computer hardware — laptops or tablets in the exam room? Host the system on their own server, or in the cloud? Hire a technolgy specialist, or outsource the job? Vexing as all that is, the practice's business manager, Vicky Bonato, says it's probably not even their biggest challenge. "Having everybody have a positive attitude to do it. If we could all keep positive and just get through it and learn it," she says, "if we could do that I think we'll be OK."
Not every doctor in the practice is enthusiastic about switching to electronic records. Mike Spangler has been practicing medicine for 40 years. He's not convinced that going digital is going to make things better. "It's going to take a lot of time; it's going to decrease productivity," he says. "And it's going to be very expensive. So, it means kind of three strikes against it and not as many strikes for it." 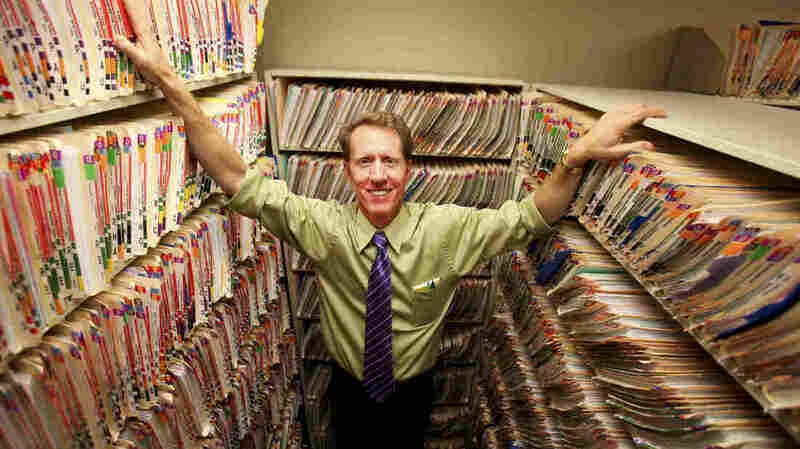 Dr. Michael Spangler, who has been practicing medicine for 40 years, is happy using paper records. He isn't convinced that going digital will be an improvement. Spangler isn't just griping. Margret Amatayakul, a consultant who has written about digital health records, says the experience leaves a lot of doctors frustrated. "Especially when people are finding that they bought a product and now are not happy with it," she says. "It wouldn't surprise me if there would be two or three times a replacement process before things settle down for any given practice"
The message from the federal government is much more upbeat. It says American medicine is making great progress toward reaping the benefits of the digital age. The White House says more than half of U.S. doctors are now using electronic records in a meaningful way, and the Obama administration's head of health information technology says digital records will transform the practice of medicine.